This is a smattering of the videos that we took out of our windows, etc., while trying to find our way around Minami-Sanrikucho. It'll give you some idea of how much help and support the people of this village need during this time. Not only the people who've gone to the evacuation centers, but the people just a stone's-throw away from being washed away, who have their houses but no food and supplies. 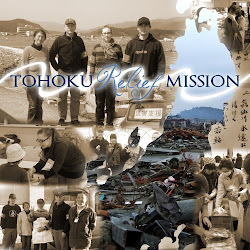 It also reinforced the things that I've heard many times but never taken very seriously about how ferocious and devastating a tsunami can be. I wondered how many people ran up to the forth floor thinking they'd be safe, and got washed away out of buildings that they never thought a wave could reach. Incredibly moving footage. It is impossible to imagine that the impact of these scenes could do anything less than motivate us to do something about it. May God help us all to do what we can.